Provide comfort for the family of Dana Herbert with a meaningful gesture of sympathy. DANA L. HERBERT, 50, of Toms River, NJ, passed away on Sunday, February 10, 2019, at home. She was born in Atlantic City, NJ, and resided in Howell Twp., NJ, prior to settling in Toms River, 15 years ago. Dana was employed with K-Mart. She was predeceased by her parents, Richard and Doris Bonnet. Dana is survived by her husband, Carl Herbert of Toms River; her son, Christopher Herbert of Toms River, NJ; her daughter, Brooke and her wife, Jamie of Texas; her brother, Jeffrey Bonnet; her sisters, Jaqueline Bonnet and Trisha Bonnet; her mother-in-law, Alice Herbert; her sisters-in-law, Kay Herbert, and Elizabeth Herbert; and by her brothers-in-law, Jimmy Herbert and Jeff Herbert. Relatives and friends are respectfully invited to attend her memorial gathering from 6-7:30 PM followed by her Memorial Service at 7:30 PM on Saturday, February 16, 2019, at the GEORGE S. HASSLER FUNERAL HOME, 980 Bennetts Mills Rd., Jackson Twp., NJ 08527. In lieu of flowers, contributions may be made in Dana’s memory to the Multiple Sclerosis Society, NJ Chapter, 480 US Highway 9 North, Suite 301, Woodbridge, NJ 07095 www.nationalmssociety.org or to the Manchester First Aid & Rescue Squad, 29 S. Colonial Dr., Manchester, NJ 08759 and would be greatly appreciated. For directions, further information, and to send condolence messages to the family, please select a tab on the left. Donations are being accepted for: National Multiple Sclerosis Society NJ Chapter. 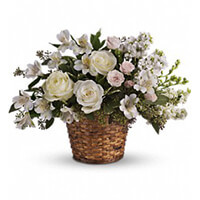 Consider providing a gift of comfort for the family of Dana Herbert by sending flowers. Aunt Judy, Doug & Debbie Bonnet and Family sent flowers to the family of Dana L. Herbert (Bonnet). I will light a candle for you and your family to lead you threw your dark times. I will say a prayer for you and your family to help heal your heart and soul. I will keep you in my thoughts so you know that you are not alone. Our sincere condolences. May she Rest In Peace. Aunt Judy, Doug & Debbie Bonnet and Family purchased the Love's Journey for the family of Dana Herbert. 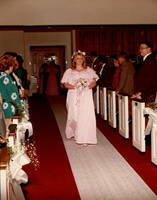 Dana and Carl's wedding day. Wonderful memories.